Visiting new places is always fun and inspiring for artists, but many of the best paintings have been made close to home. 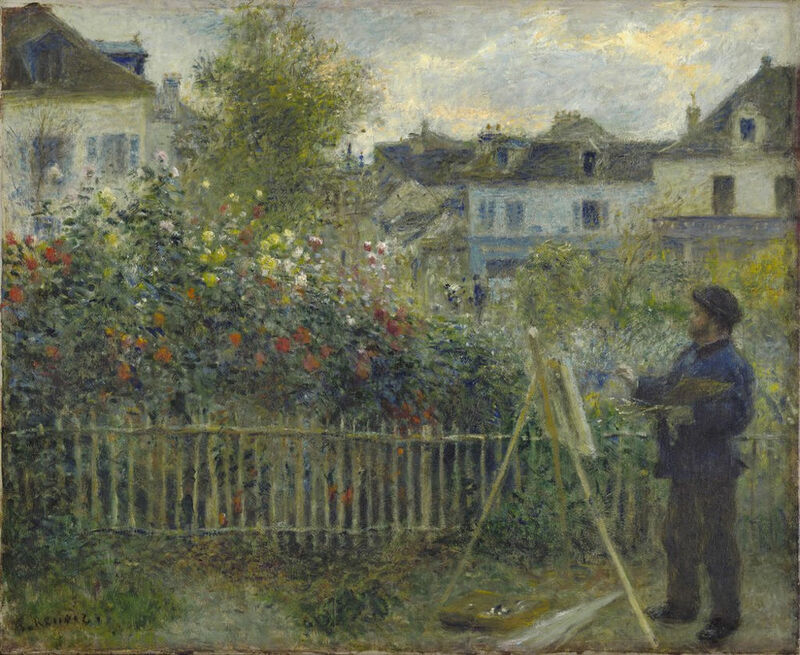 One of my favorites is one that Renoir painted of Monet in his garden. It’s just a homey painting of a backyard with other houses in the distance. Today I decided paint a scene that I see every day from my breakfast table. 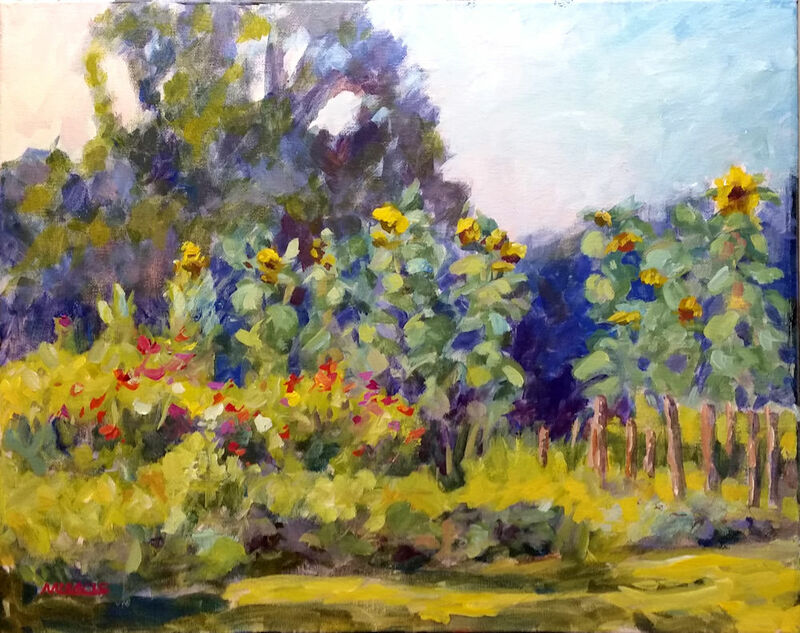 It is of my garden this month with the tall sunflowers and multi-color zinnias and other flowers. The rest of the garden is still producing but is beginning to look a little straggly this time of year. We’re still getting plenty of tomatoes, eggplants, beans, and peppers. But it’s the flowers that I really love. The birds and butterflies love them, too. Garden in August. The sunflowers and zinnias are in full bloom. The vegies are still producing heavily. Lots of tomatoes, eggplants, beans and peppers. I got out early to take advantage of the cool morning and the shade. The canvas is primed with a beige color and painted black on the border. Garden in August, step 1. Here I have generally covered most of the canvas. Notice that I’ve edited the trees in the background to provide more interest. The first step as usual for me is to lay in the general composition and the dark colors. As you can see, I did some editing, removing the line of trees in the background and just including a few big trees. I also squashed things together a bit for the composition. Garden in August, step 2. More blocking in plus I’ve added the sky and most of the foreground. Next I laid in more darks and some brighter greens as well as the sky. I wanted a rosy early morning sky….so I made one. 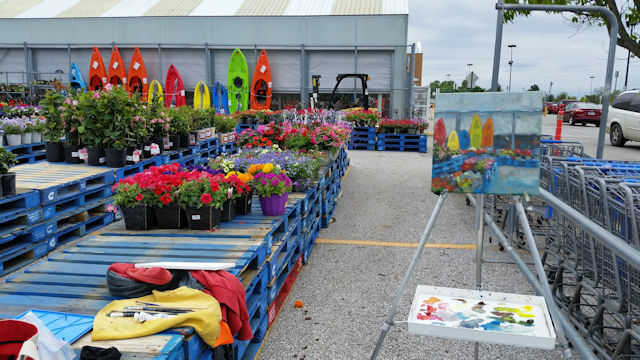 Actually the most difficult part was painting the flowers. It is so hard to get them bright without being gaudy. I ended up painting a light wash of pale green over some of them to tone down their brightness. The entire painting took about three hours minus some time for a phone call to a friend while I was waiting for paint to dry. The point here is that you don’t have to travel a great distance to find something worthy to paint. A good subject might be just outside your window. 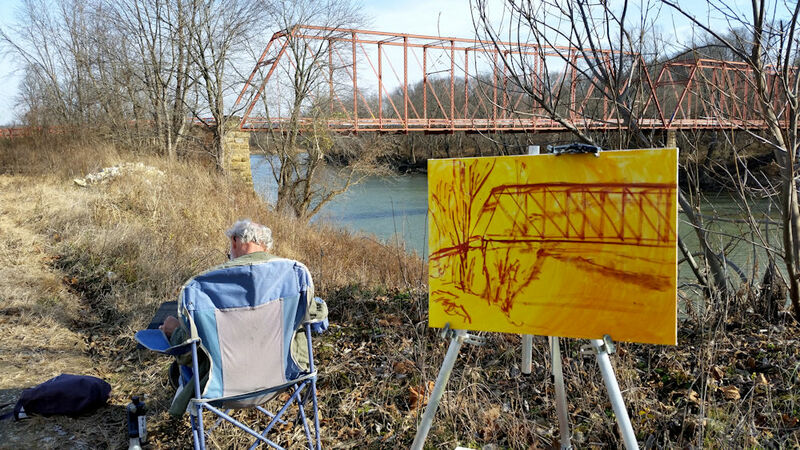 I went plein air painting with my friend Bill Whorrall this week up in beautiful Martin County, Indiana. There is just a small window between the dreariest of winter and the veredant summer. This time of year the landscape sports so many different shades of greens, as well as the beautiful red-bud, dogwood and other spring flowers. I wanted to capture the scene before it was gone. 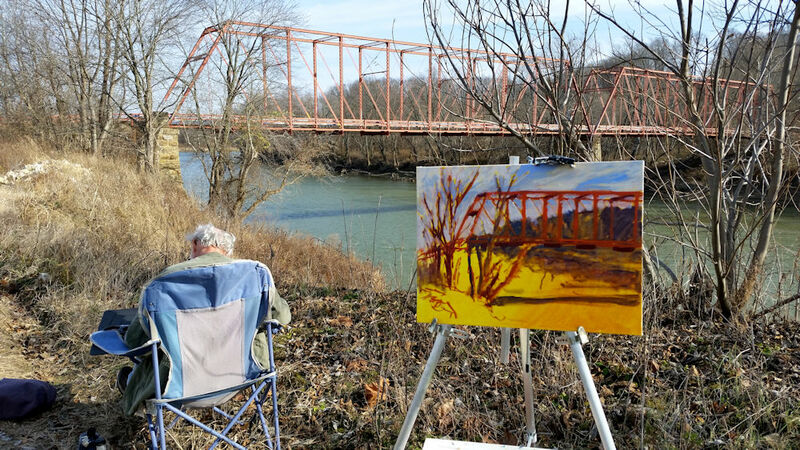 Plein air painting in Martin County, Indiana. The Overlook in Shoals. 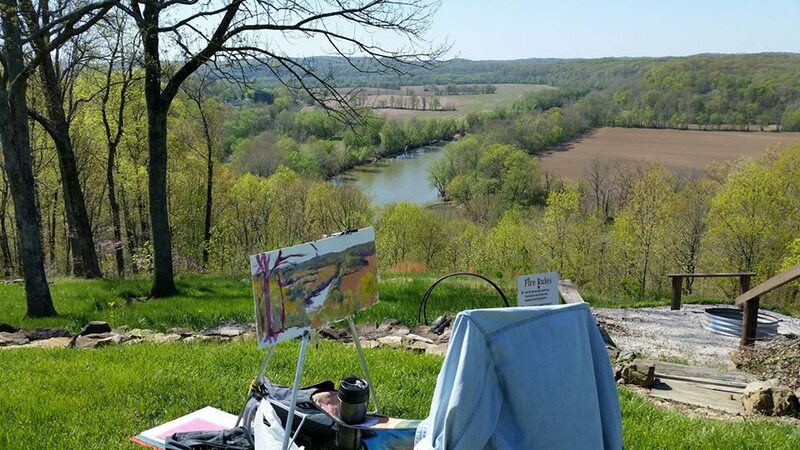 This day we painted at The Overlook in Shoals, Indiana. The scenery is gorgeous any time of year but especially now with the freshly tilled fields. The river you see there is the White River which can sometimes be pretty angry. Now you can see it as the peaceful water highway it once was. The painting is acrylic on hardwood which has been gessoed and sanded. I chose the longer format as it seemed to fit the landscape. I only had a couple of hours to get most of the painting down before the sun had moved. A few final tweaks were done in the studio. Unfortunately, I accidentally deleted all of my photos for the day so this is the only one available from my Facebook page. 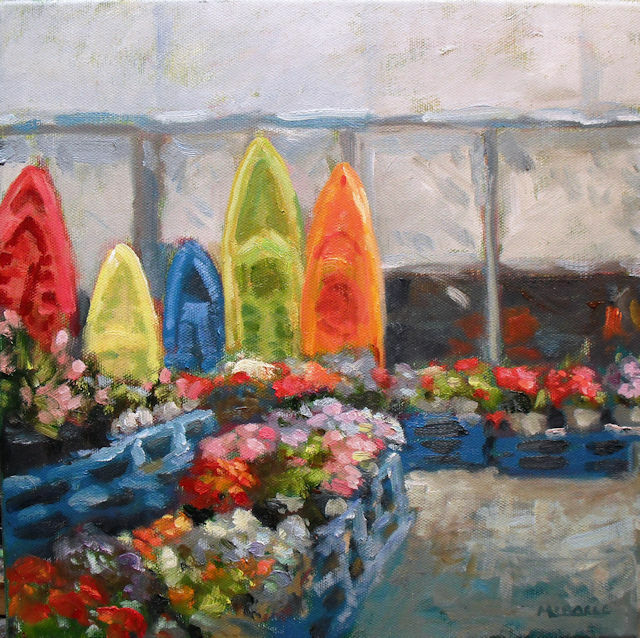 Yes, the painting is for sale on my Etsy shop, KitMiracleArt. The Overlook in Shoals, Indiana. Martin County. 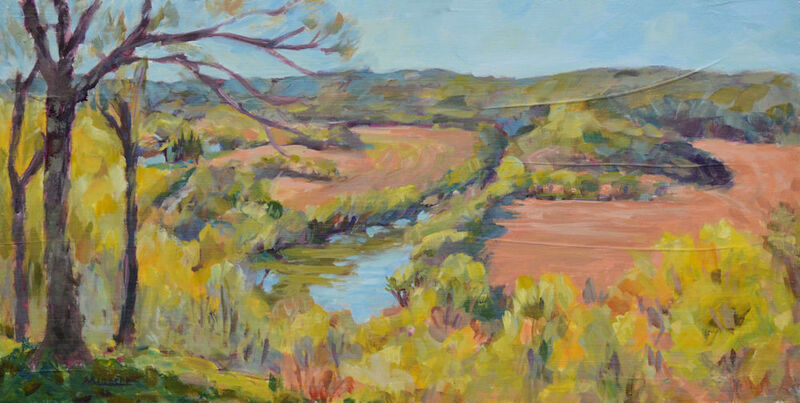 Acrylic on wood panel,12 x 24, Kit Miracle, Spring landscape. A question that I often receive is, “Are you still painting?” This puzzles me. Do we ask musicians if they still make music? Or writers if they still write? The answer is, Yes, I paint nearly every day for several hours. This is what I do. I can’t seem to help myself. 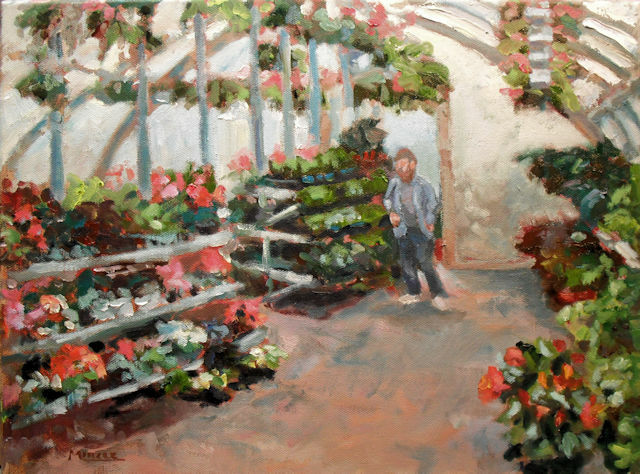 I often do some inside work or gardening in the early part of the day, then head out to the studio and paint. And paint. And paint. These are three paintings that I completed last week. This large one is acrylic on canvas 24 x 30 inches. The scene is from the Missouri Botanical Gardens in St. Louis. As it’s only a few hours away, my husband and I like to visit for a quick trip. The gardens are beautiful in nearly any season. 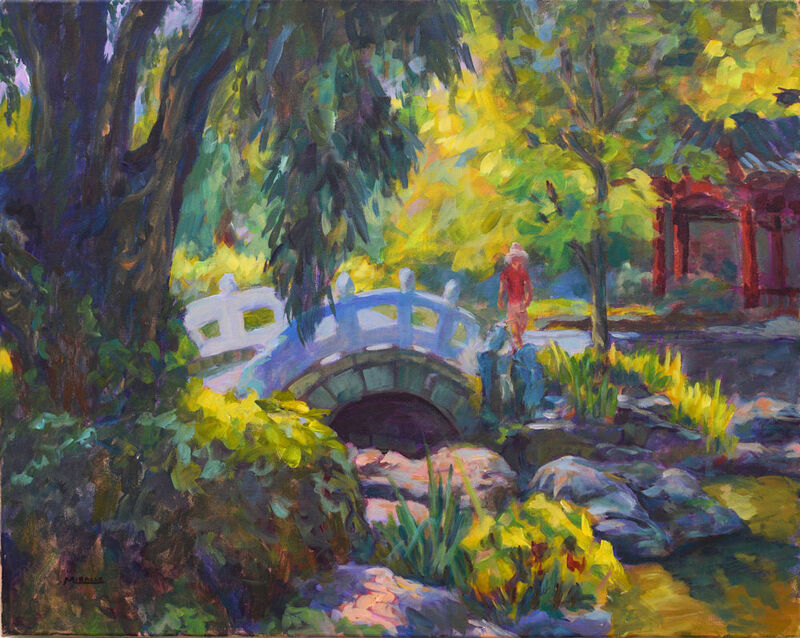 The scene depicted here is from the Chinese garden area. I was attracted to the bridge, of course, but also the back lighting. 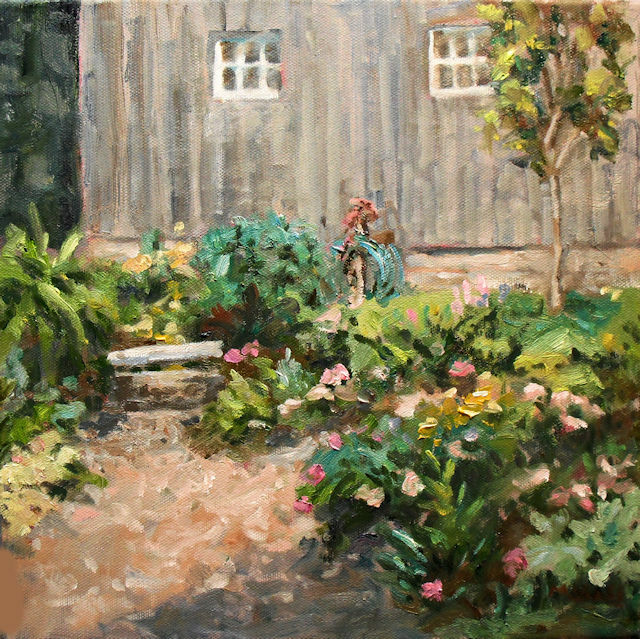 It has some echoes of Monet but is pure American impressionism. 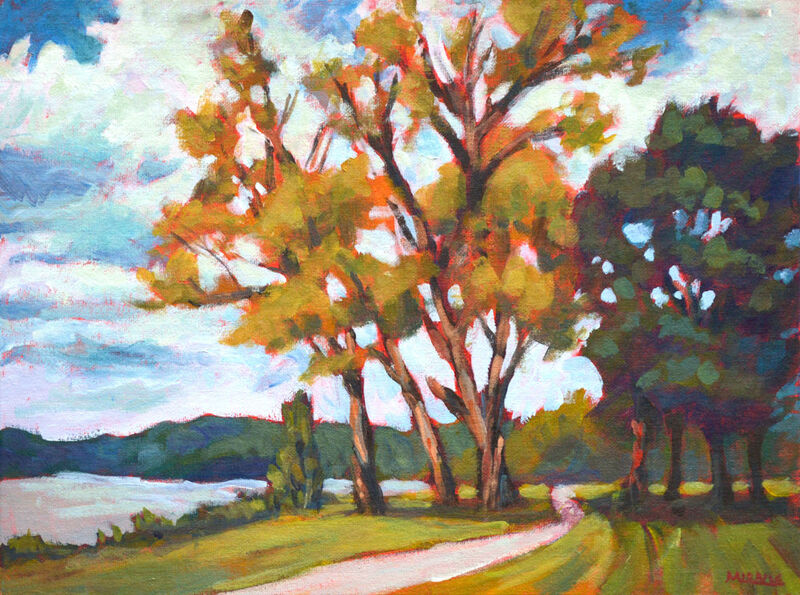 The next painting is called Windy Day at the Lake. 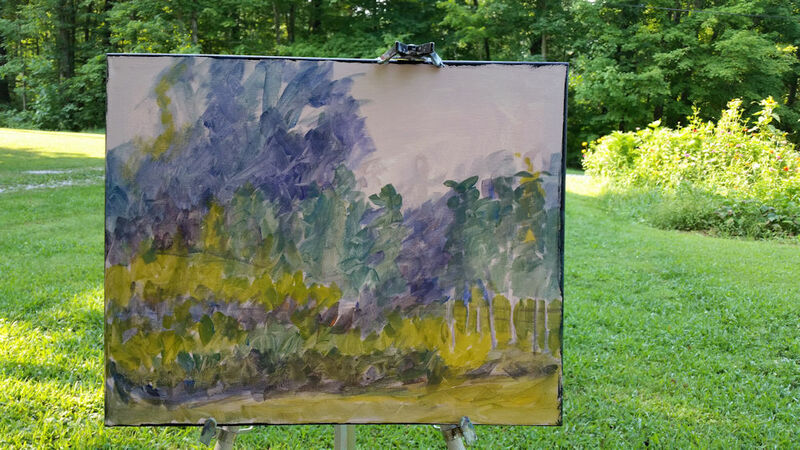 I painted this en plein air on Friday. 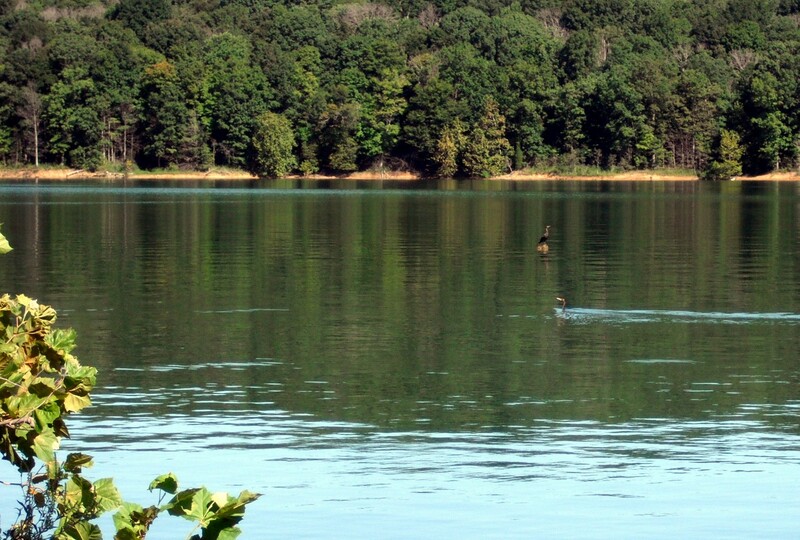 My husband and I went over to the Lake (Patoka); him to fish, me to paint. We found a nice sheltered area and had a wonderful morning at the lake. The acrylic sketch is 12 x 16 on canvas board. 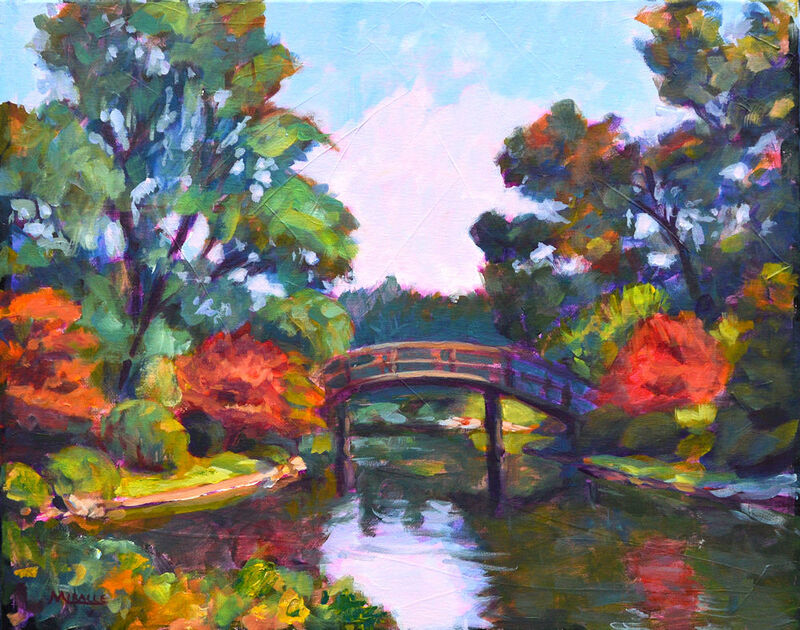 The final painting that I completed last week is of the bridge in the Japanese area of the Missouri Botanical Gardens in St. Louis. I was attracted to the early autumn colors, the shape of the bridge, and the reflections in the lake. Painted in acrylic on canvas, it has the edges painted black so it wouldn’t necessarily need a frame but could be hung as is. It just gives such a feeling of peace. So, as an artist, this is what I do. 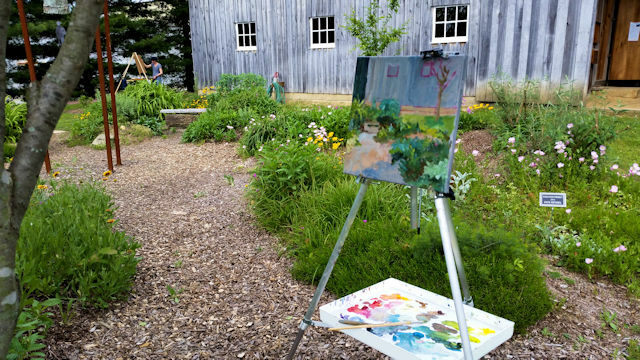 I went plein air painting with my friend Bill Whorrall on Monday. 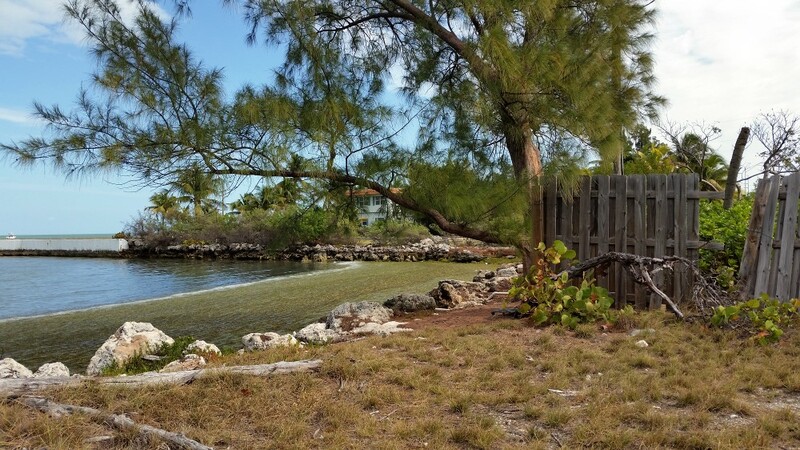 It was a beautiful and unseasonably warm December day with temps in the 60s. However, the wind was brisk which posed some problems later. 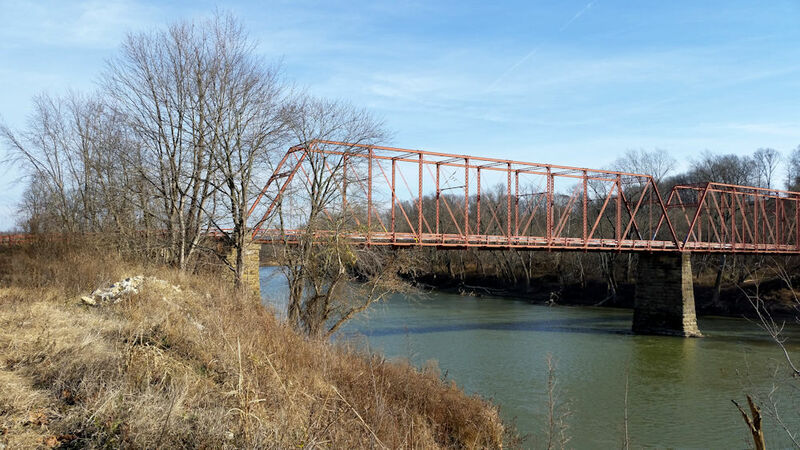 Bill lives in Martin County, Indiana which is lovely and boasts a variety of terrains – rivers, stone ledges, hills, woods. 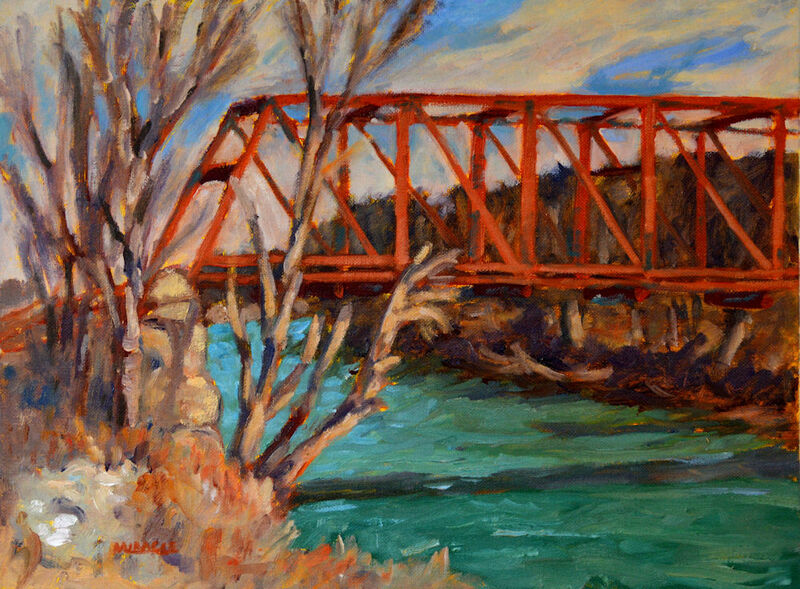 We decided to paint this one lane bridge, Brooks Bridge, which spans the East Fork of the White River south of Shoals. We had spotted this location before but the ground was too wet to drive on. While we were painting, we saw about four vehicles, including a four wheeler; probably the farmer checking us out. (It’s hunting season and there are lots of poachers.) I just waved and he drove back. The sparse traffic is probably why the bridge is only one lane. Yeah, impossible for you city people to believe but they still exist. Bill was working on some ink drawings that he created with sticks and twigs as drawing instruments. You can see the results here. Really neat. 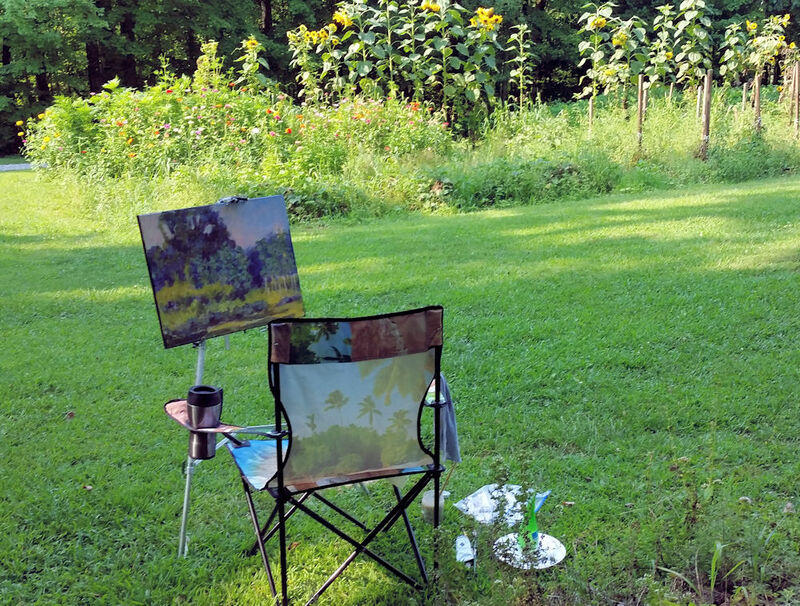 Plein air painting along the East Fork of the White River south of Shoals. My friend Bill Whorrall is drawing with ink and sticks. I decided to use a canvas panel toned with yellow paint. It was pretty bright but where it shows through, it seems to add some magic. I like it anyway. 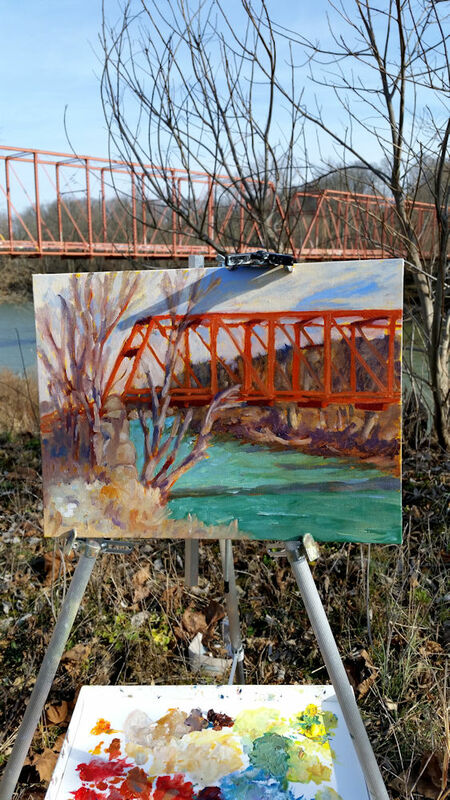 Plein air painting of Brooks Bridge. 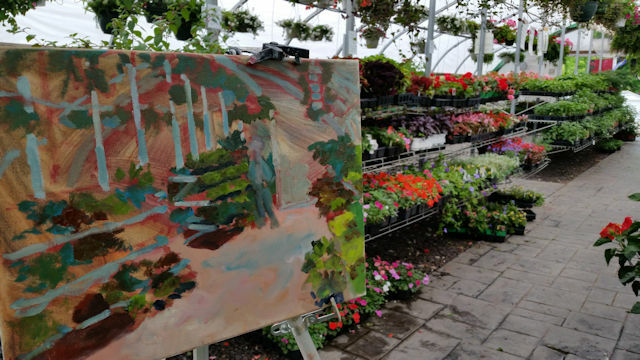 The wind nearly took my easel right after I took this photo! The only real problem was that the wind picked up throughout the morning. A strong gust nearly knocked my easel into the river! I tweaked the final painting in my studio, darkening the details and adding highlights. It’s sometimes difficult to really see and judge colors and contrasts in the bright sunlight. What do you think? Yeah, it’s for sale at my Etsy shop. We were in Georgia last month for a wedding at the Barnsley Estate. We stayed at a wonderful bed and breakfast a few miles away called the Sage Cottage. Owners, Jim and Sharon Southerland, were such gracious hosts and made us feel welcome in every way. The house is actually quite large with really beautiful grounds. Another wedding party had taken over most of the remainder of the rooms. There was plenty of space to roam so I decided to use my time to make this watercolor / pen and ink sketch of the main house. It was difficult to choose a view as the grounds were laid out so well, with hidden nooks, statuary, and gardens. 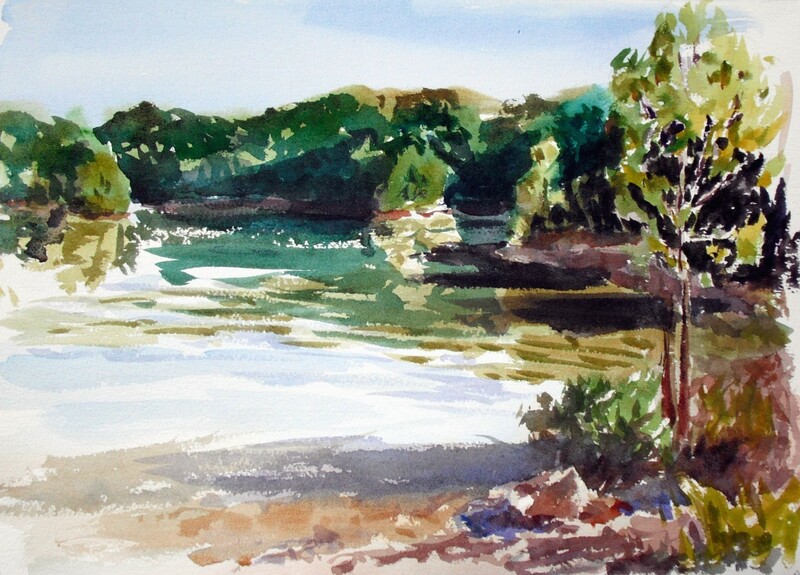 This was painted in a Pentalic Aqua Journal which has really thick pages, almost like cardboard. I use a couple of clips to hold the pages open but otherwise, there is no buckling from watermedia. I only wished later that I had used a larger sheet of paper, maybe an 11 x 14. This is 5 x 16 (5 x 8 landscape notebook). First day of vacation for me…finally. 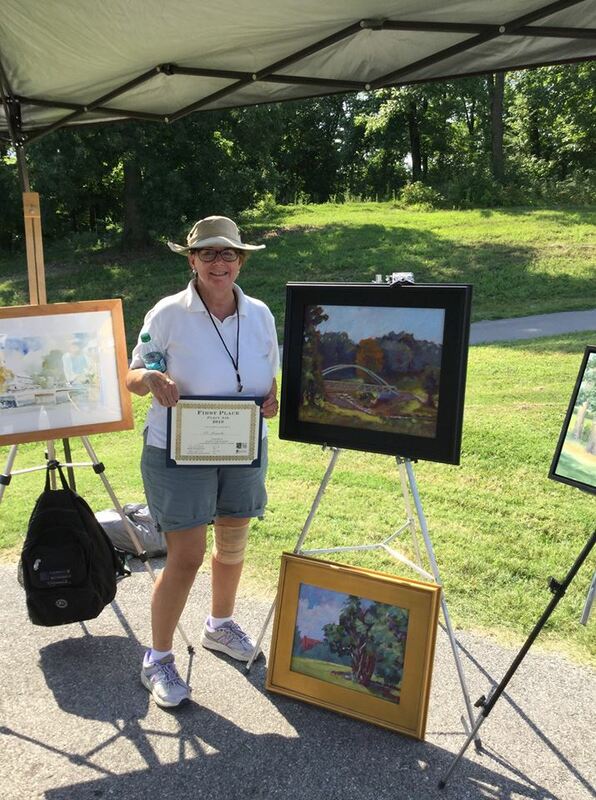 So does a plein air painter sleep in? Heck, no! 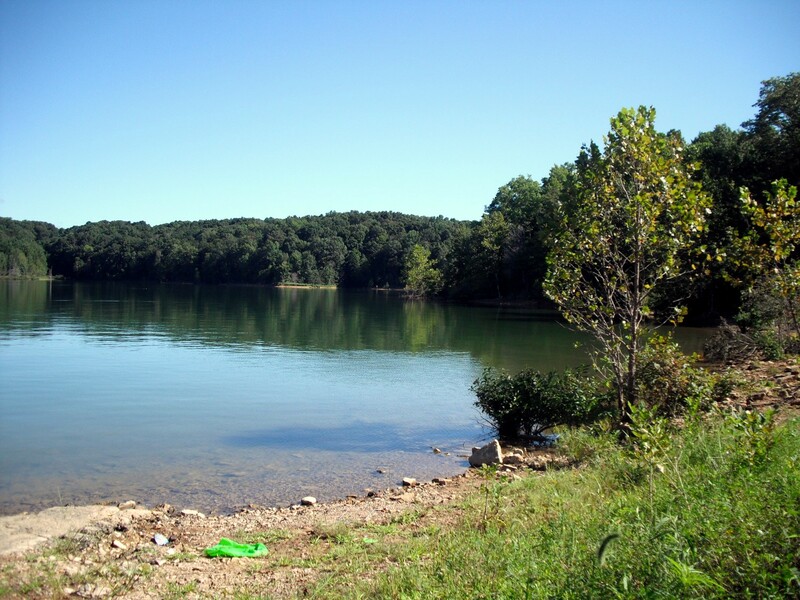 Up at the crack of dawn to paint at the beautiful Lake Patoka which is just right down the road from me. Fortunately the oppressive heat wave is over for a while so the morning could not have been more pleasant. 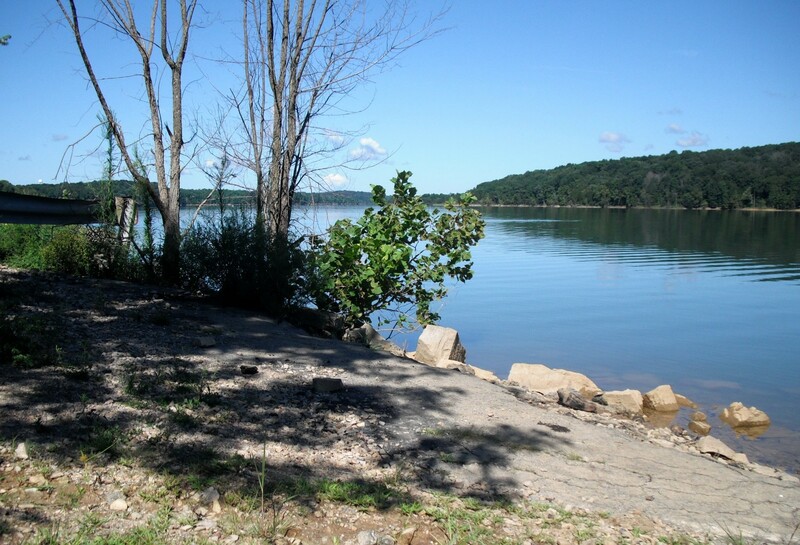 Lake Patoka has 8,800 surface acres set in a 29,000 acre state recreation area. So peaceful and not crowded. 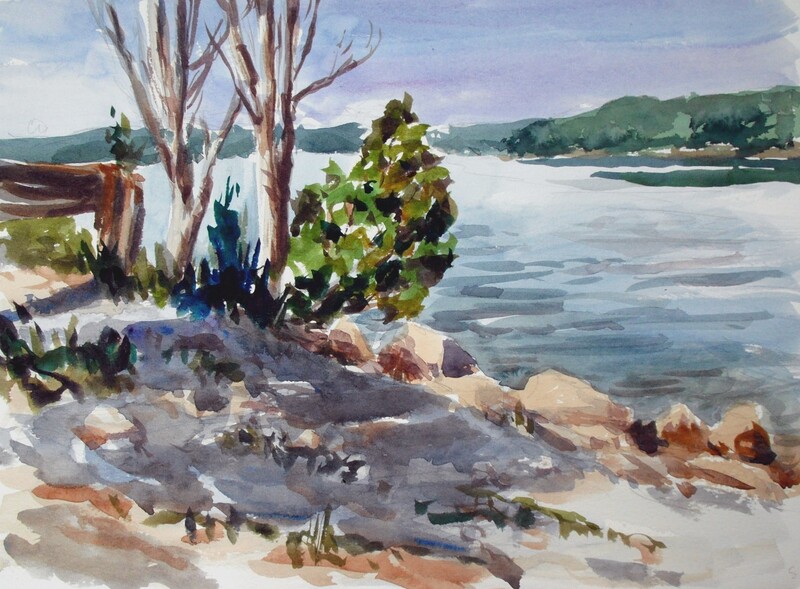 I have been scouting places to paint and selected this site on the eastern side of the lake. No one was there except me and the cormorants fishing for their breakfasts. 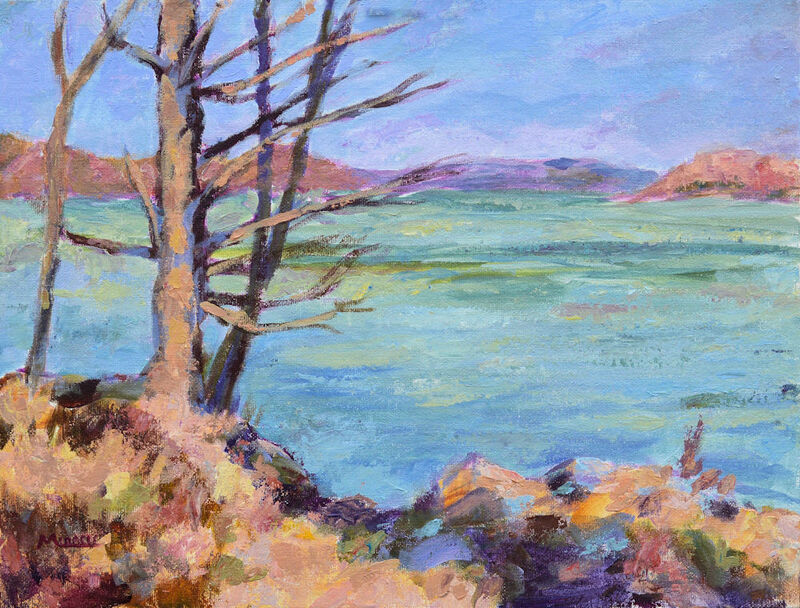 The first painting was facing north with the strafing light and shadows from the right. The second painting was facing west with the sun at my back.